American and Israeli officials said that President Donald Trump's controversial campaign promises to move the US embassy to Jerusalem was still on track, but would be implemented cautiously and over time. "From the conversations I've had with US government officials, I know they are serious in their intentions...but I definitely don't think they will move the embassy in a day," Jerusalem mayor Nir Barkat told Army Radio on Monday. White House spokesman Sean Spicer on Sunday confirmed that plans were only in the preliminary stages, though had also announced last week that announcements regarding the embassy were forthcoming, given that "the president has made clear that Israel has not gotten the respect it deserves." But for Palestinians, the threat is already here, drawing ire and threats of escalating conflict across the region. The embassy move will "open the gates of hell in the region and the world," wrote the al-Aqsa Martyrs Brigade, the military arm of the ruling Palestinian Fatah Party in control of the West Bank, in a Facebook statement, adding that the move would constitute a "declaration of war against the legitimate rights of our Palestinian people." "America will lose the status of mediator and influential role in the political process" and will turn into "one party in the conflict," said Fatah official Nasser al-Qudwa. Mushir al-Masri, an official from the rival Hamas party, told the pro-Hamas Shehab Media that moving the U.S. Embassy to Jerusalem would spur the armed group to "operate at all levels to confront the move," and would make an enemy of the American administration as "the other face of Occupation." In Israel, right-wing politicians have hailed Trump's victory and remained hopeful that his administration will give Israelis a freer hand in expanding settlements in the disputed West Bank and in Arab East Jerusalem. On Sunday, only two days after Trump's presidential inauguration, Isreal announced plans to build almost 600 new settlement homes in occupied East Jerusalem. 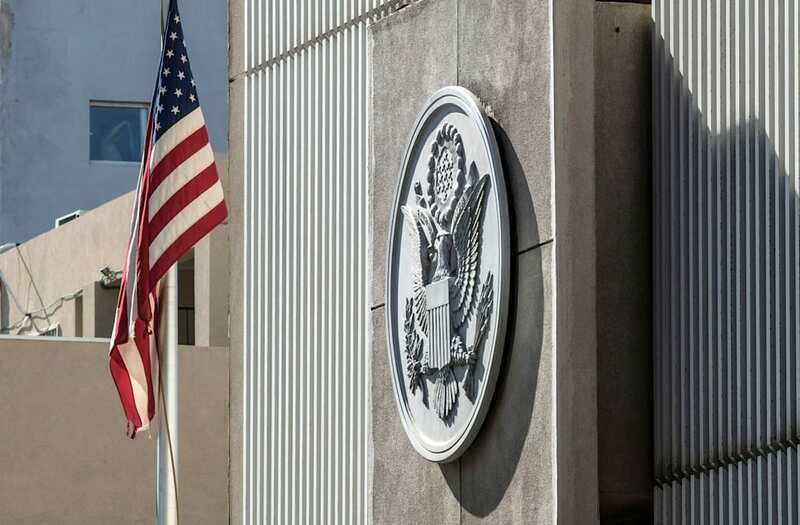 The American embassy, along with most foreign diplomatic posts, is currently located in Tel Aviv. If Trump were to move the embassy to Jerusalem, it would represent a major change in US policy that has for decades left the status of the city, claimed by both Israelis and Palestinians as their holy capital, up to peace negotiations. While US politicians have upheld the view of Jerusalem as Israel's undivided capital since the congressional passing of the Jerusalem Embassy Act, every American president since then has maintained the embassy in Tel Aviv in order to preserve the status quo as well as alignment with the United Nations, which does not accept the Israeli annexation of Arab East Jerusalem since capturing the city in the 1967 Six Day War. The White House confirmed on Sunday that President Donald Trump invited Prime Minister Benjamin Netanyahu to Washington in early February in a phone call, though the official White House record omits any talk of the US embassy move. But as Trump's Israel policy remains unclear, world leaders are already making contingency plans. Netanyahu and senior ministers were briefed by Israeli security services on possible violence scenarios in the event of an embassy move, according to a report by the Israeli daily Haaretz. Palestinian President Mahmoud Abbas met on Sunday with Jordan's King Abdullah II in Amman Jordan in order to formulate a list of steps they would take if such a decision is implemented. Following the meeting, Abbas said that the "best contribution the United states could make" would be to "not discuss moving the embassy to Jerusalem and, second, to lead negotiations between the Palestinians and Israelis with the aim of achieving a political settlement."